Product Description:- The enumeration of absolute numbers of T-helper cells (commonly referred to as a CD4 count) has become an essential part of monitoring the course of immunosuppression caused by the Human Immunodeficiency Virus (HIV) and the initiation of Anti-Retroviral Therapy. The Alere Pima™ CD4 test gives you the ability to monitor patients while they are still in your care. 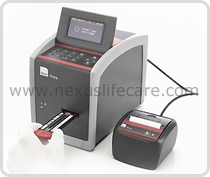 Consisting of the Alere Pima™ Analyser and Alere Pima™ CD4 Cartridge, the Alere Pima™ CD4 test enables CD4 T-cell analysis at the point-of-care from a fingerstick or venous whole-blood sample in only 20 minutes, providing an effective and affordable tool in the management of HIV patients, specifically designed to serve the needs of the healthcare professional in the field, the laboratory or the office.